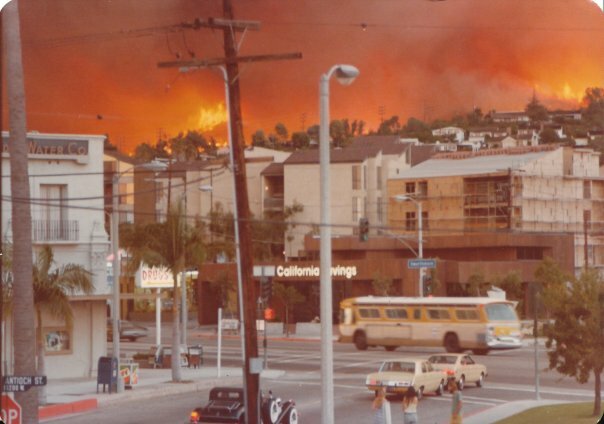 Thirty-three years ago today, October 23 1978, a fire broke out at 9:41am near Mulholland Drive and the 405 Frwy in the Santa Monica Mountains. Stoked by Santa Ana winds and very hot, dry conditions within a few minutes a large brush fire started moving westward. Thirty homes were destroyed in Brentwood and Pacific Palisades - it could have easily been ten times that number. 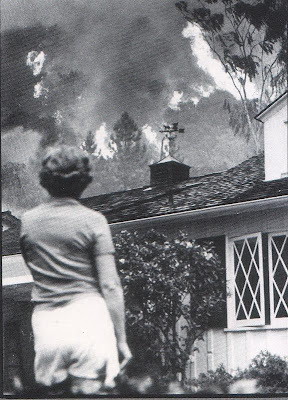 By contrast, the 1991 Oakland Hills fire destroyed 3800 homes - and killed 25 people. Here's another color photo. 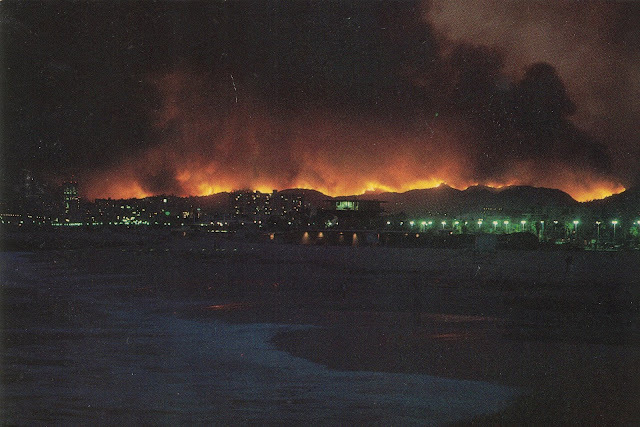 It was actually a postcard, and was for sale for several years afterwards.The back of the postcard reads: "Santa Monica Mountais on fire-Fall 1978. The fire is nearly 10 miles wide in this photo taken from Venice, Calif. Photo and copyright by Jeffrey Stanton." 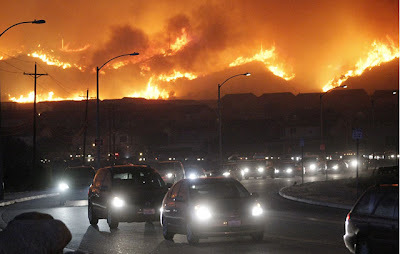 Every year Southern California deals with brush fires. In fact, three years ago today, another fire broke (below) next to the 405 Freeway - very close to where the Mandeville Fire began 30 years earlier. Fortunately, it was put out quickly. 1) the speed of the fire. 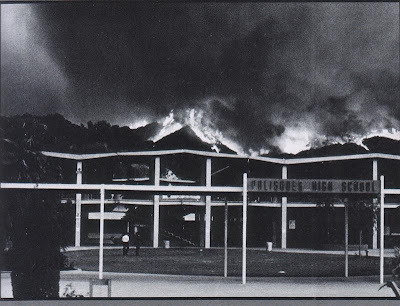 When I got home from High School, I literally thought the fire might be near our home sometime in the next day or two. We were evacuating within 2 hours. 2) the size of the fire. There is something terrifying about a 50-60 wall of flames several miles wide coming towards you. 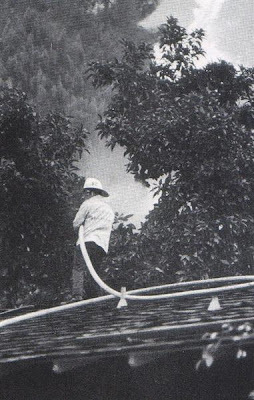 Trying to defend your home with a garden hose felt like a bad joke. 4) the SOUND of the fire. This was perhaps the scariest thing of all. I still remember the low, loud roar. It was surreal. 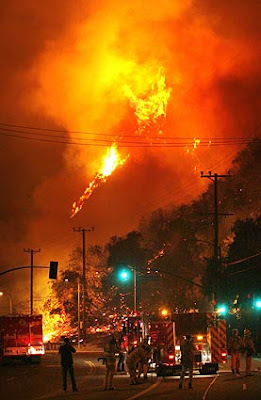 The Marek fire (above) in the San Fernando Valley in September of 2008 was a reminder that brush fires in Southern California are not a question of "if" ... but "when." One of my professors at UCLA stated that a fire every ten years is significantly less dangerous, less intense than one every fifty years. 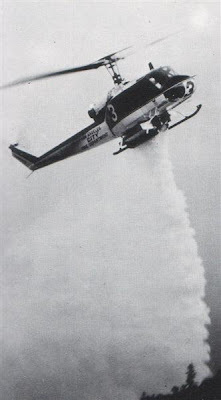 "The probability for an intense fast running fire increases dramatically as the fuels [brush] exceed twenty years of age. 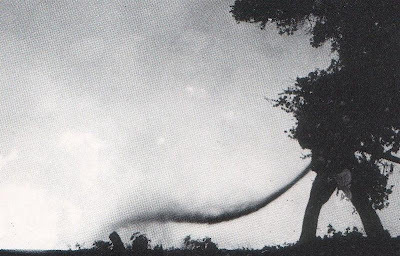 Indeed, half-century old chaparral - heavily laden with dead mass - is calculated to burn with 50 times more intensity than 20-year old chaparral." 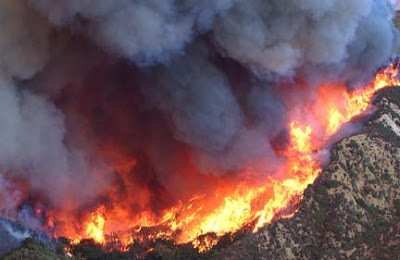 I have to now agree that it would make sense to have controlled burns of large uninhabited mountainous areas every 10-12 years - but most experts agree it will never happen - it would be political suicide. 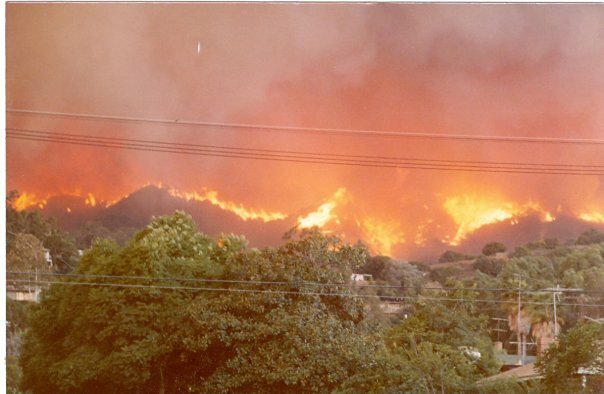 Thank you for allowing me to post: I lived off El Hito Circle, I distinctly recall standing on my parent's roof hosing it down as the flames came over the hill and into a gully full of Fire Fighters .... Man ! They have a lot of Yables !! I was a student at UCLA and saw the fire starting while walking to class on Bruin Walk. The winds were indeed high and it was ignited by a fallen power line up near Mulholland Drive. I snapped a few photos with a pocket camera that I carried along in my backpack - will send you some scans if you'd like. My email is TKHelble@aim.com. Thanks a lot for your interesting site! I've been reading Joan Didion's "The White Album" (a collection of essays, many about CA. She was born in Sac and lived in CA most of her life. Particularly if you're interested in the 60s and 70s, she's fascinating and a great writer) and encountered a piece about this fire. Didion lived in Malibu at the time and she knew a lot of the people who lost their homes. I went looking for more info and found you! You have the best pictures of the fire I've found so far, and your first-hand account is very interesting. I also am amazed by the speed of these fires, and the wind they generate. I read that this fire became a firestorm (I THINK that's the term used when the fire becomes so hot it actually ignites the oxygen?) and burned in excess of 2500°, generating its own wind of around 200 mph. So you see how it can move fast... I don't really understand the physics by which fires generate their own wind - the result of the energy created by the heat? If anyone reading here knows, please explain...). Also, you mentioned environmental factors. I know that an early transplant to the area from Australia, the eucalyptus tree, burns like crazy because the bark is loose and papery. It's sad that it took so long for us to learn the dangers of these transplants of nonnative species. Eucalyptus really love the SoCal climate. I wish to correct the photo credit for the photo taken on upper Las Lomas through the telephone and power lines of the flames along the ridge. Michael A Pearson DID NOT take this picture and pirated it. My husband, Karl Edward Dean, was the photographer and took this photo that night. Please make the correction, removing Michael A Pearson's name and giving Karl Edward Dean photo credit. I would even prefer that you watermark this photo with his name on it!! October 23, 1978. I drove to the Forum in Inglewood from Santa Barbara to attend the Neil Young concert there. As we approached the Conejo Grade East of Camarillo on the 101, we faced a huge black mass of dark smoke dead ahead. I did not think we were going to make it to Inglewood or if the show would be canceled. 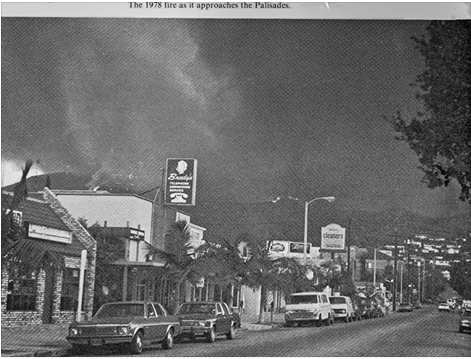 All the way from Newbury Park to the Forum we were flanked by huge fires. It was scary and we were surprised to find that the roads weren't shut down. In relative safety of the huge Forum, the concert got underway even as the fires raged seemingly everywhere around us. 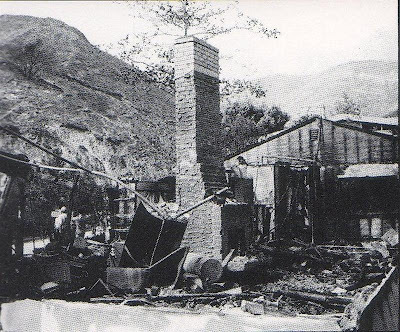 Neil then announces that he had fled his Malibu residence earlier that day, which had been destroyed. 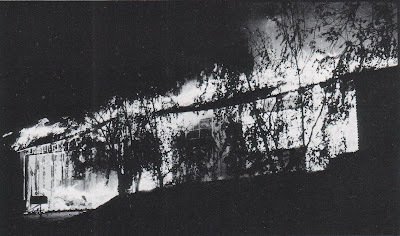 On the return drive, what had that morning been beautiful homes burned like big, bright candles all along the way until we exited the Santa Monica mountains area. It was a bittersweet experience, emotionally caught up between the great music and the terrible losses suffered. Thank you for hearing my little piece of history, on 10-23-78 which is a date I could never forget.